In a 365 day year, there are only a few days where excessive eating is not only permitted, but actually encouraged. First is Thanksgiving. Foreign born students I went to grad school with were often mystified by the holiday. One Scottish student I knew was very concerned about the possibility of being offered pumpkin pie ("isn't that some kind of squash? "), but he survived. The other day is Mardi Gras, but that's not just an American thing. 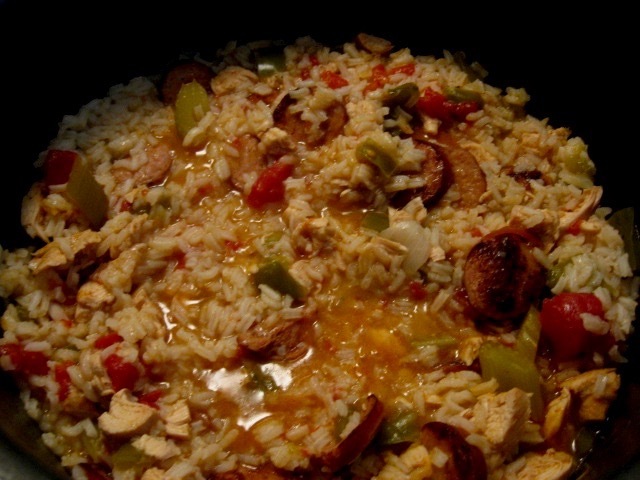 The name means literally Fat Tuesday, so not eating too much seems like a crime. There are a lot of traditions in a lot of different places, but I tend to go New Orleans style, as spicy food is always welcome at Studio Arrabbiata. So this morning I walked to the supermarket across the street and bought what I needed to make a batch of jambalaya, which made a tasty, if slightly late lunch. Plenty left over, but that will have to wait a few days- as Mardi Gras is a prelude to Ash Wednesday and the self deprivations of Lent. It will be good when I get to have it again. The show at Ocean County College was set up about a year ago, and was scheduled to run for the month of December 2016. While it was still on the walls we received an e-mail from the organizer that we were invited to extend the run into late February. Don't know if there was a cancellation or if no one else wanted the space, but they had nothing else lined up for early 2017 and the simplest solution was just let us keep our show up on the walls. With no conflicts, I agreed, as did just about all the other artists in the show. Scheduled take down day became Tuesday, February 28th, and I wrote that on my calendar. Last week on the day I work on campus I stopped by the art center box office and verified the plan, leaving my number with the person in charge, in case there was best day/time to come take it down. The next day I received an e-mail from the organizer requesting that we remove the show any time before February 28th. I had free time both today and tomorrow, but they are predicting possible rain tomorrow, so the request to move things up a day works out well. On the way there this morning I stopped at my parents' house and picked up my hand truck, stored in the shed there. 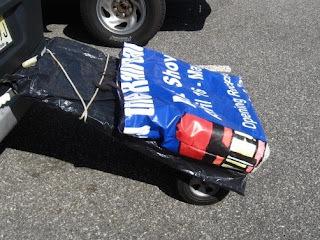 Had other packing materials at home or in my car (including the recently repaired giant Belmar tote bag). The trip down was uneventful (I commute there once or twice a week for the past decade), but I decided to leave everything in the car and check first. Took the elevator up from the theater lobby and the first thing I noticed was that my portrait print was missing from the big curved wall. When I reached the hallway where I had hung all the boardwalk prints I found all my work there, but not much else- only one other artist from our group was still on the walls. So I went out to my car, got my packing materials, and went back up to the 2nd floor. When you have materials and a plan, packing is easier than installing, so I had the whole show down and wrapped in less than 10 minutes. Back on the 1st floor I stopped by the office on my way out the door to let them know I had grabbed my stuff, then went to the car. The repaired Belmar bag easily held all five framed boardwalk prints. All of the above would make for a pretty busy day, but it wasn't even noon yet, and I expected this would be a double header. Submissions for the annual show in Belmar will be due in a few days, so I thought I should work toward that. All my show art was now back in my apartment, so back to my car and drove to the Studio. My college friends had decided not to come back up to Jersey to see the extended run of the Shore Scenes show, which was perfectly understandable. If they had come back to Jersey again, the one thing that might have lured them was pizza. 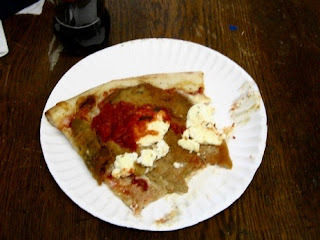 Back in December they hit two classic shore area pizza places on consecutive days, and were impressed that both had eggplant as an available topping for pizza, which I guess still hasn't reached the South. Didn't have time for a whole meal at either of those classic places today, but in honor of the occasion, I went to the place across the street from the Studio and got a slice to go eggplant parmigiana pizza. With lunch taken care of, went to work on some art. 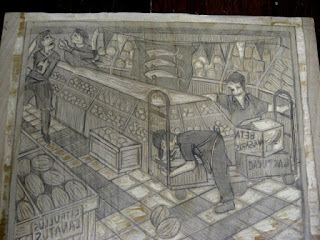 When I proofed the latest supermarket block last week I thought it was in pretty good shape, just needed some touch up. So I did that, removing stray mark bits from the floor, faces, cleaning up the lettering of signs and stuff on the u-boat, and other minor changes. 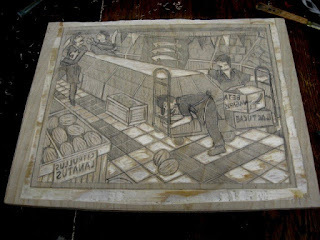 The second proof of a block always goes easier than the first, but this time I took more time, just because this one will be judged more- so re-inking parts, more careful rubbing. Results are below. Originally I had considered producing a second print (reworking a previous block) to submit to the Belmar show, and may yet do so in the next few days. But this and the show removal had me kind of tired, so I cleaned up and called it a day. Spring plans involving me and the Belmar Arts Council are starting to come together. 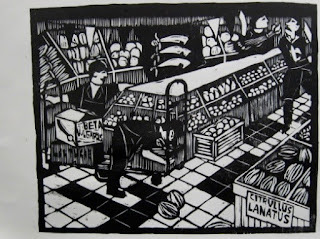 I have made arrangements for a spring offering of my woodcut class there, April into May. In the process of researching materials and places to find them for my Mentor student at the university I am also collecting information I will need for the Belmar class, since the supplier I used for the class in the past has taken itself out of business. Coming sooner is their annual Juried show. As with all Belmar shows, one of the challenges is to find things to submit that I haven't shown already. That alone would be reason to finally finish this latest supermarket print, started last year. The application process involves sending a jpeg, and having a finished framed piece can wait, so if the ink isn't dry yet, no problem. But I do want the print finished before I take that digital image, so the next step is to pull a proof and see where I'm at. Last week I brought the block with me to my Mentor class and demonstrated how one can take a pencil rubbing of wood block to get a sense of how the balance of black and white is coming. I decided it was good enough to try a proof without any further cutting. With this Mentor class, pretty much everything I do as art is a potential teaching moment and this print has been no exception. 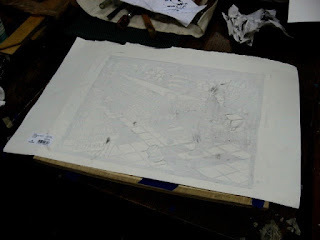 The rubbing demo last week, and today my choice of ink and paper, a topic I have been dealing with. My prepared syllabus listed three common papers I have used a lot, and I even gave him a few samples last week. For today's proof I went with a piece of Rives Lightweight, which is my standard choice for all prints in this series. For ink I decided to try Gamblin's Portland Intense Black Relief ink, which I had found to be an inexpensive but decent ink, and a potential for my upcoming Belmar class. All first proofs have issues, often linked to the wood absorbing the ink. This one is no exception. Some of the broader areas of black (floor tiles, figures) could have used a little more ink, but I had realized that some more minor cutting will be needed and this proof will not be needed for the exhibition itself. I noticed the proof shifting on the block and decided to end the session and start cleaning up. In general I am satisfied with what I'm seeing. 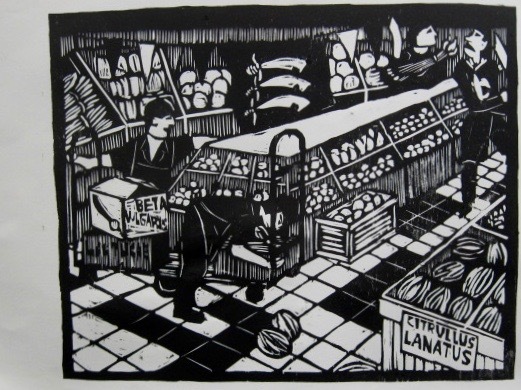 One of the nice things about woodcut is you get what you expect. I believe this is #24 in the series, and by now I know how to get them to have the standard supermarket look. The image is fairly readable, with a good mix of black, white, and grays, and if the perspective isn't perfect (I'm not big on using perspective systems), it won't be a distraction either. In the coming days, after the block has dried a bit, I'll go back in and cut away things leaving stray marks, maybe fix the areas around the lettering a bit, and then pull a nice clean proof to use for my submission. I left the inky block in the rack at the Studio, but took the print home with me to study, and to show my student later this week. Got the word out a few days ago that it was critique time again. Been about a month, and to wait much longer puts us into March. Had one positive and one negative response to my e-mail, so it was on. Actually we ended up with three people, two besides myself, although some others were there in spirit. 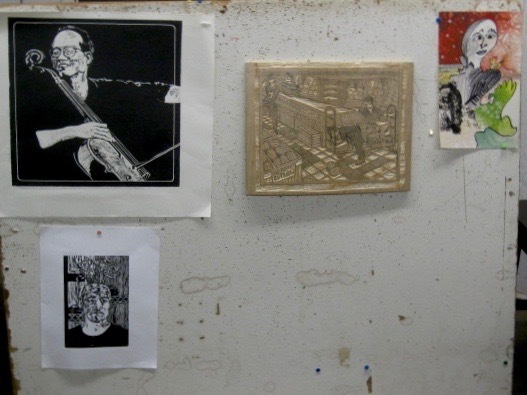 In the above photo, the two black and white woodcuts to the left are from Mary- the top one more or less finished, the bottom one with a ways to go. The block is mine, just completed earlier today, and the colorful piece to the right is one of the Tim collaborations (started by our regular member Tim, and passed off to be completed by other artists) Margery had brought it back to us tonight, and she thinks as many as two others may have worked on it as well in between. Mary would go ahead and take it home, though not sure if she would have something to add to it. Margery also brought us a new (to us) ceramic piece. My first reaction was that it seemed biblical- lot of stories in both Old and New Testament of people fleeing with babies, likely on the backs of animals, to avoid massacres. In Superman's case it was a rocket instead of a horse, but he also survived. 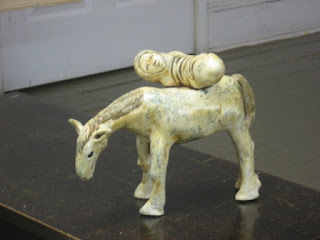 She says that this was not the association she was going for, but we all still liked the piece, citing the expressions on the horse's face and the color variations in the glaze on the horse. Time for the latest critique, but there's the usual problem- this time of year there are usually dance classes on Monday nights at the Studio building, which means that by around the time we begin there may be few or no parking spaces available in our lot. And with the chilly air and constant wind blowing today, that's a lot of wind chill to walk through if you have to park far from the building. So when possible, I will arrive in the afternoon when spaces are available, and that's what I did today. 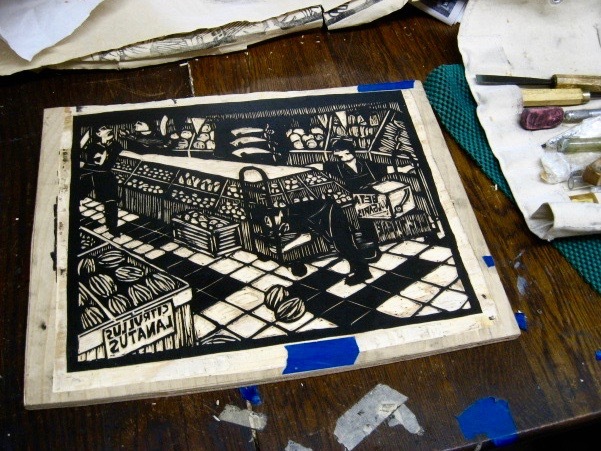 To occupy the two hours before the critique was scheduled to begin I had two plans- finish creating what I need to complete my syllabus for the independent woodcut class I'm teaching right now, and continue cutting my latest supermarket block. And so that's what I did. I had cut more of the block during a class last week, leaving not much left. The sections I worked on tonight were mostly along the top part, the deep background of the scene. Which means the cutting may be done. I don't want to proof it yet (will use the block to demo something in class this week), so I left it there. Crazy weather going on this week. Today was in the 60's, and tomorrow we are expecting a major snow. Whatever happens, I expect to have class on Friday, and I need one of my clamp lights for what I have planned, so I took a quick trip to the Studio this afternoon to pick up the one I keep there. I had a little time before I had to leave to get to class and decided to stop by the beach there in Ocean Grove. A few weeks ago I wrote about how I was concerned that the bad weather at the time might prevent me from picking up the seashells I use for one of my 3D projects. A day like this and it might be worth the quick trip. So I drove up the street and parked on the last block. As I mentioned a few weeks ago, the beginning of the semester seem to bring a lot of bad weather, so the days I search for shells are not always pleasant. Today was one of the nicer ones I've had. As I had expected, not much there on the beach, but I did run across a few bunches here and there. And with only two students in that class this semester, I quickly found enough to supplement the ones I had left over from last year. Then back to my car for the journey south to the college. Just had a fairly busy week for school stuff, but some more cutting got done. Last Wednesday I brought the block and my tools with me to school. Partly because I was going early and knew I'd have some time to kill, and partly because that class had been shrinking and I knew I might not have much to do. Both situations turned out to be correct, and with just one student showing up I had both time and space to get some cutting done during the four hour class. 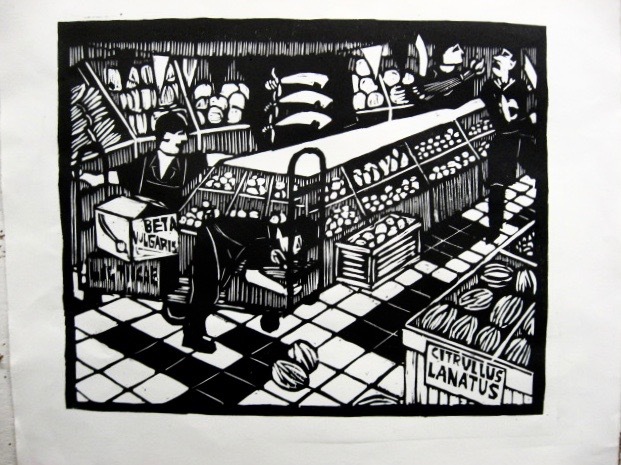 A few days later I was teaching woodcut at my other school. A new class for me, an independent study thing with a student working toward his BFA show. He wants that show to include woodcuts, and when you want to learn woodcut in New Jersey, I'm the guy. This was set in motion last semester and will be a part of my schedule this semester. My one day per week at that school, teaching two other classes, I'll also meet with this student and guide him through the world of woodcut. That show will not be this academic year, which is good because there's a lot of work to be done before then. My part of that work includes creating a syllabus for the class, which I want to get done before our next meeting. Meanwhile a lot of e-mails between me and my Intro students. There's always a lot of chaos near the beginning of a semester, but we should get it all straightened out. Today back to work on the block, this time at the Studio. Among the things done since I last wrote about this, I cut out the four figures, my "English flag" (the classic red on white St George's cross flag that is the traditional symbol of England was still two centuries away, so I went with the Flag of Essex, suitably ancient with three Saxon seaxes, a kind of sword that looks a lot like the large butcher knives I've seen used by supermarket meat cutters), boxes and a lot of Latin words, and a lot of the optical grays, which I was thinking about anyway as my woodcut student had a lot of questions about how to handle that kind of stuff in his work. 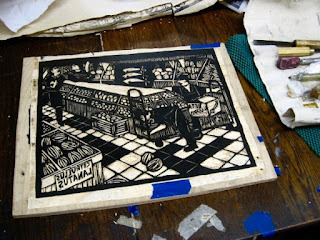 In the evening, online research into materials for the woodcut class, and for a possible upcoming woodcut class in Belmar. My ink and paper supplier the last time I taught in Belmar took itself out of the business a few years ago, and my supply stock is starting to run low.